Bengaluru: Govindrajnagar MLA and Lingayat community leader of Karnataka, V Somanna, openly expressed his happiness with the BJP. Sources hinted at how his relationship with BS Yeddyurappa soured and this may have resulted in JD(S) jumping into a poaching attempt. According to sources, the JD(S) leaders have already held talks with Somanna to welcome him into the party's fold. V Somanna was spotted cosying up to JD(S) chief HD Deve Gowda and other Congress leaders in the presence of state BJP president BS Yeddyurappa during the last rites of Siddaganga seer Shivakumar Swamiji. Talking to MyNation, V Somanna said, "I am not happy with the political development for the last few years. Some leaders have hurt me. Regarding switching to another party, I will not say anything now." Somanna further added that he respects Deve Gowda as he was successful in every political move of his. He recalled his time with the Janatha Parivar reminiscing how he would spend time with Deve Gowda. "In 2000, Congress leader DK Shivakumar approached me and later, I joined Congress. In my political career, I have maintained good equations with politicians belonging to various parties," Somanna said. JD(S) leaders denied approaching Somanna. However they seem to be keen on bringing leaders from rival parties into their fold ahead of elections. "We have no problem in welcoming any BJP leader into our fold. 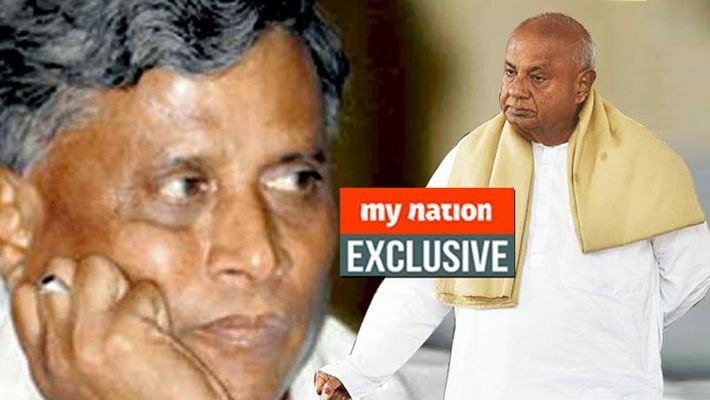 With respect to Somanna, he was a Janata Parivar man and he has worked with HD Deve Gowda during the Kanakpura by-election in 1999-2000," said CS Puttaraju, minor irrigation minister. Echoing similar sentiments, Congress spokesperson, Kengal Renu said, Somanna was in the Congress too and he would have become a minister if had continued. The leaders seem to be unhappy and he will become irrelevant in the BJP in the coming days. "If he is willing to come to Congress, he will be welcomed. However, he will lose out on his seniority status," said Renu.